I’m always finding ways to use up the second half of my buttermilk carton. That’s because most of the time the recipes I use call for only a bit, plus it’s not like I’m feeding an army here at home. It’s terribly inconvenient that the supermarket stocks them in such large quantities. 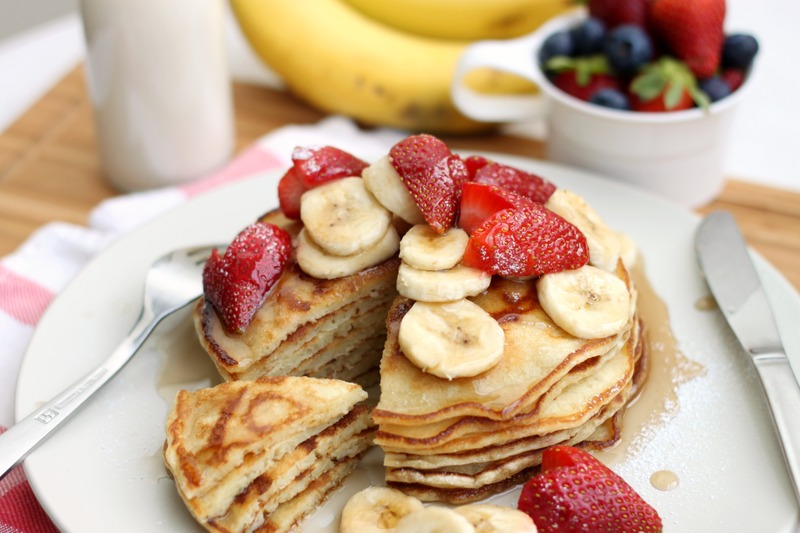 And then, I thought of pancakes. 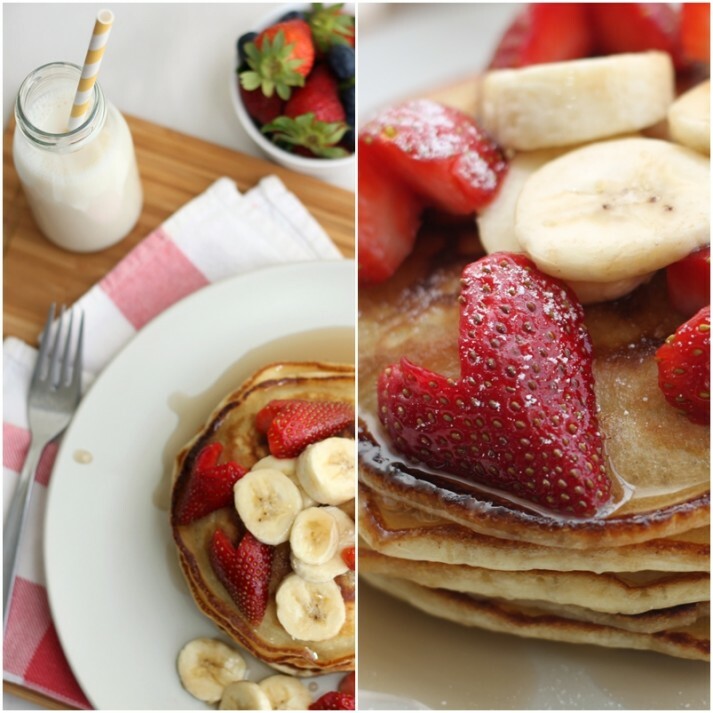 Yummy, scrumptious, light and fluffy buttermilk pancakes! 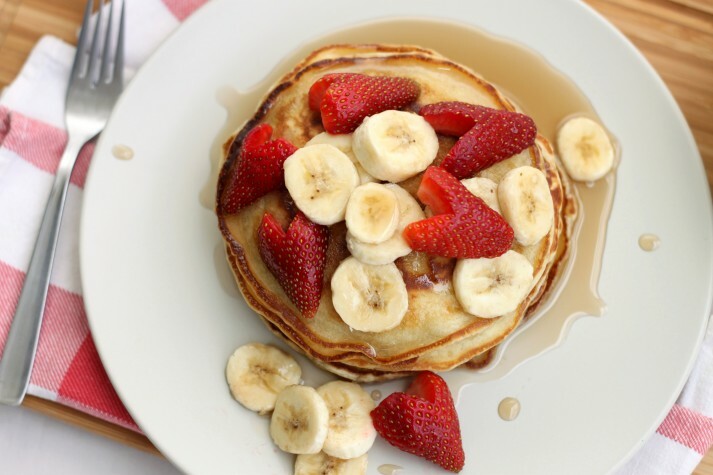 I’m a total breakfast person, so pancakes are definitely top of the list when it comes to my idea of an all-day breakfast menu. The use of buttermilk just changes the whole texture, making it BETTER. And I love it. 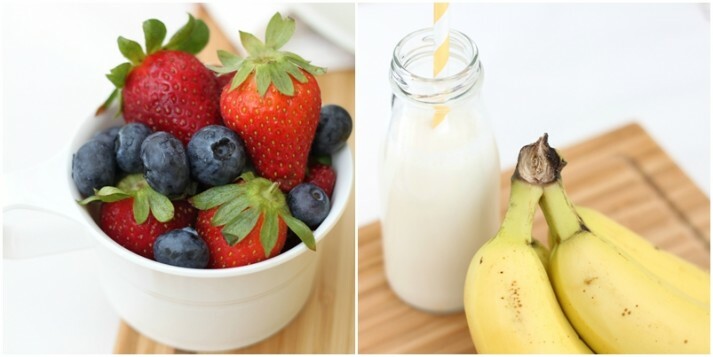 Top them off with maple syrup, banana slices, fresh berries, even nuts and whipped cream. Maybe some homemade jam. Or granola and Greek yogurt as a healthier option. And how do stewed cherries with chocolate chips sound? 1. In a large mixing bowl, mix together the flour, sugar, baking powder, baking soda and salt. Set aside. 2. Using a blender, blend the buttermilk, eggs, melted butter and vanilla extract on low to medium speed until well combined. 3. Add the flour mixture to the blender in batches, blending for a few seconds between each addition to make sure the mixture is combined. Blend until the batter is smooth and thick. 4. Add the milk to the batter, one tablespoon at a time. The consistency should start to become thicker, a bit like honey. 6. Pour 1/4 to 1/3 cup (depending on how big you want them) of pancake batter onto the pan. Cook until you see bubbles form on the surface of the pancake. 7. Using a spatula, carefully but quickly flip it over. Cook until golden brown. 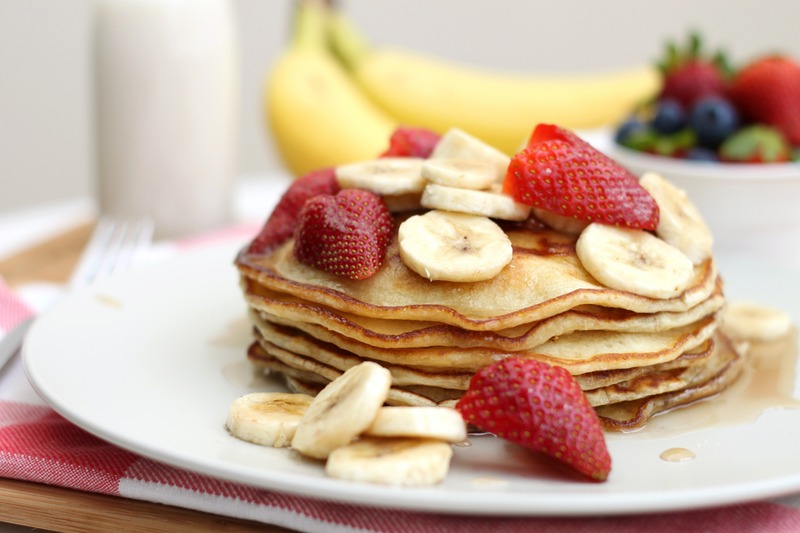 **NOTE: Pancakes are best made to order, so eat them fast! Otherwise, if you really must: spread them on a baking sheet lined with aluminum foil and keep warm in a 95 degrees C (approximately 200 degrees F) oven for up to 20 minutes. **ALSO NOTE: If you don’t have a blender, you can always whisk the ingredients together by hand. But the blender just helps to get everything perfectly smooth! 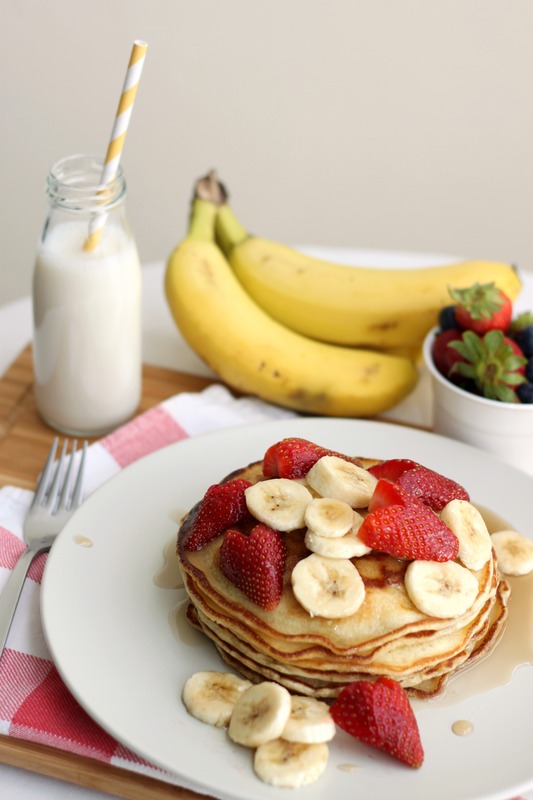 I had mine with maple syrup, bananas, strawberries and icing sugar. Also soy milk! Now, have I tempted you to cook something for breakfast this weekend? They only take 20 minutes to prepare! Do the strawberry hearts look familiar? 😉 You can learn how to cut them here. 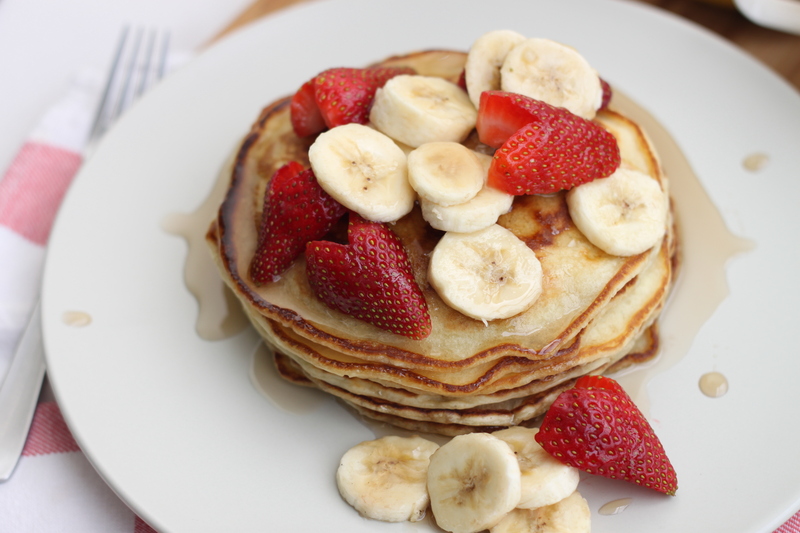 Oh, and about pancake mixes… FORGET THEM. Each time I see them sitting pretty on the isle with a picture-perfect stack of mouth-watering pancakes slapped on the cover of the box, I let them pass me by. It’s totally not worth it; I cannot even begin to understand why people would eat mixes out of boxes when you can make them on your own, fresher and healthier (just go easy on the syrup- but then again how can you). Let me remind you that buying convenience isn’t going to buy you a healthier diet. A simple rule of thumb: good (healthy) food is always quickly perishable. And that means not those with a shelf-life of two years. Go figure.